Stunning barn conversion in secluded Peak District hamlet, unwind & relax! Rated 'Excellent' on Trip Advisor with 79 reviews rating us 5*. You will experience the highest standards & modern facilities here, which continue outside with a wraparound patio and a fabulous covered hot tub area, great to soak after those long walks in our glorious surroundings, or to simply watch the dramatic skies we get as you relax at the end of the day exploring the National Park. This was our second two-week visit within six months! For us to return to the same place for a holiday is almost unheard of. When we returned from our first visit, the choice for September was 'Florence or the Barn'. The barn won, hands down! Lynn and Nigel are so welcoming, and the property itself so sublime, everything you could wish for in a holiday. I just hope it doesn't get booked up too quickly next year, so that we can come again ! We will have to time our holiday around the dates when the Barn is not booked up. Lynn and Nigel, you deserve every success. Liked best: Our friendly dealings with Lynn and Nigel. Liked least: Having to leave at the end of our fortnight. The barn is fabulous, very pleased to have found it. Everything is pristine and we are very picky customers to please! The food on arrival and the cake were excellent finishing touches that made the whole stay exceed our expectations. We will certainly recommend it to friends and hope to return ourselves at some point. An outstanding barn conversion with exceptional attention to detail. The extras provided such as a lovely homemade meal and bread, fresh eggs and a lovely table all beautifully set for your arrival was amazing. Our trip was for 2 adults and 2 teenagers to go to Alton Towers, which was on 15 minutes drive away. The hot tub was very much appreciated after a hetic day at theme park. My description of this accommodation would not do it justice, it is a must to stay in this accommodation if your planning to visit this area, highly recommended. Luxurious barn with everything you could need for a wonderful break. The hot tub to relax in and the extra personal touches 'home made bread,cake and meal on arrival' made our week away perfect .Beautiful location and only a stones throw away from anything you need. Lyn and Nigel should be very poud of their wonderful holiday Barn. The barn is for guests who enjoy a ‘non smoking’ & ‘pet free’ environment, we sleep 4 + infant, in a luxurious super king double & a cosy twin bedroom. Our beds have ‘heavenly’ deep mattress toppers & a choice of pillows. The super king double has a fabulous en suite wet room, the twin en suite a bath with shower. You have constant hot water & underfloor heating at no extra cost, from our eco friendly ground source heat pump. We book Friday to Friday, giving you the advantage of experiencing a full week end at the start of your holiday & one at the end when you return home too! A hot supper with wine awaits you on arrival. so no worries about what to cook or where to eat, just sit back, relax & enjoy a home cooked supper, a great way to start your holiday. Ford Old Hall Barn with log burner & hot tub: Luxury Peak District barn only 8 miles from Alton Towers. You will not need to bring anything with you apart from your luggage! A home cooked hot supper with wine awaits you on arrival. We also provide a breakfast basket with a home baked loaf, croissants, pain au chocolat, pain au raisin, preserves, butter, milk, eggs, tea, coffee & sugar - enough for your breakfasts for a week end or short stay. All detergents for dishwasher & washer provided, you will only need to bring your personal choice of toiletries. We provide white fluffy towels, white cotton bed linen, duvets & additional towels for use with the hot tub. We strive to exceed your expectations & will try to accommodate any special requests you may have so don’t hesitate to ask & we will see what we can do. The area is fabulous for walking & cycling, there are a number of converted railway tracks offering fairly flat routes through to very challenging routes through the hills & forests, the choice is yours. We have secure facilities for bikes & alarmed garaging for motorcycles. Step back in time in this Peak District hamlet: Ford Old Hall is 1567 & Grade II listed, whilst the Barn is a 21st century conversion offering discerning guests the highest of standards with all modern facilities, yet retains the absolute charm of this 16th century farming hamlet which still has that slower pace of life as it is off the beaten track, yet only 15 minutes from the local market towns of Ashbourne & Leek. Located in the south west corner of the Peak district, looking to retreat away from the ‘hustle & bustle’ with fabulous walking country straight from the door, or indeed, want great amenities close by, then look no further than Ford Old Hall Barn which delivers it all. It nestles in this charming farming hamlet getting you right back to a little pocket of rural England, it feels like it's from a time gone by. Relax the moment you walk through the door! Expect the best of facilities: The barn is newly converted, upon entering there is a fully equipped utility & boot room with a washer dryer, freezer, sink & heated rail to dry off those wet clothes. The bedrooms & fully tiled bathrooms (with rain showers) are on the ground floor,all with underfloor heating. Stairs lead to an airy living space with high ceilings & feature beams, there is an open plan kitchen with 2 fridges, dishwasher, microwave, a Britannia oven with 6 gas burners & double electric ovens (multi functional) the kitchen is fully fitted in oak with granite worktops & a breakfast bar for more informal dining. The dining area for 4 leads to the very comfortable lounge area with 2 large comfy sofas made by Alstons, a free standing modern style log burner, nestle of tables, bookcase & TV with freeview channels. There is oak flooring throughout the upstairs, again, with the comfort of underfloor heating. There is under stairs storage for luggage & a wardrobe with robes for use with the hot tub. Nigel & Lynn have a wealth of Holiday Cottage hospitality experience having owned a previous cottage in the Peak District for 18 years where they attained a 5* rating with the Tourist Board. Passionate about customer service excellence with an eye for absolute detail & high standards, they aim to ensure all guests staying at Ford Old Hall Barn enjoy a fabulous experience whilst retaining a true 'home from home' relaxed atmosphere. Nothing is too much trouble, on hand if you need them, or they'll leave you in peace if you don't! Having been raised in the Peak District National Park & never underestimating how lucky they have been to do so, Nigel & Lynn wanted to find a special place to move to with a holiday cottage close by so they could ensure they were always available should guests require any help or information. Ford is that special place, off the beaten track & a piece of good old fashioned rural England with old fashioned values still being followed by the small community. They have painstakingly converted the old cow shippen into this wonderful luxurious barn. Using only the highest spec materials & finishes to ensure all guests feel that they have truly enjoyed a luxurious experience & a taste of why Ford reminds you of 'Olde England'. We fell in love with this place for so many reasons but the first has to be the lifestyle it provides, away from the hustle & bustle, it's like stepping back in time. The house, barn & land are all Grade 11 listed, from the Elizabethan era, it is a privilege to live here. At night there are uninterrupted skies with star constellations, in the day you can watch the wildlife, the woodpeckers which come back year after year or the many birds enjoying the rural landscape. You can walk straight from the door up onto the moor or you can simply head for the hot tub & watch the night skies unfold. Real escapism...no-one would know you were there! Fully tiled bathrooms with stone floors, underfloor heating, mirrors with shaver points & lights. Both en suite bathrooms have rain showers. 24 hour hot water provided by our eco friendly heat pump. Additional large fluffy bath size sheet towels are provided for use with the hot tub. Towels are provided & a mid week laundry service is available on request. Wi-Fi O2 reception for texts Emergency use - you can use our home phone. Heating is on & available along with hot water 24/7. This is provided by our ground source heat pump, it provides a constant even temperature throughout the barn at all times. Crisp, white cotton bedding with a choice of pillows. White fluffy towels, additional towels for use with the hot tub. We do offer a linen change on request for stays of a week or longer. Hoover washer/drier provided with washing powder & fabric conditioner. Ceiling clothes drier in the utility room. Heated towel rails throughout the barn. Beautiful Scandinavian wood burner with all logs provided at no extra cost. Off road parking for up to 4 cars. Secure garaging for motorcycles. Locked shed for bicycles. For the use of motorcycles. White fluffy bath sheets, bath towels, hand towels, face cloths all provided. Additional large bath towels provided for hot tub use. Open plan, with the kitchen & dining room, a great social space so no-one is excluded whilst working away in the kitchen! 2 large Alston sofas which seat up to 6 people, 4 very comfortably. A Bosch dishwasher with all the tablets & rinse aid provided for your stay. We have 2 Bosch refrigerators, plenty of space for those groceries, especially at Christmas & New Year! We have a 6 ring burner Britannia oven & hob with extractor hood above, sufficient cooking space for a full Christmas dinner! The Britannia has 2 ovens, one large & one smaller. The larger one is multi functional & both have integrated grills. If you want to heat or cook something quickly, there is a very 'easy to use' microwave oven. Cafetiere (French Press) to enjoy roast coffe. 2 slice electric toaster, plus the 2 grills in the ovens. Salt,pepper, olive oil, vegetable oil, gravy granules, Heinz tomato sauce, HP brown sauce, mayonnaise, herbs. Cling film, foil, matches. The kitchen is fully equipped to cook a full Christmas dinner! You won't need to bring any of your own utensils. Fully fitted & equipped kitchen with oak units & granite worktops, plenty of space to cook family meals. The dining area is open plan with the kitchen, there are 4 bar stools to sit at the granite counter for more relaxed dining, or a country style pine table with 4 chairs for more formal dining. Stereo player provided with an assortment of CD's. DVD player provided with many films also provided for people of all ages. Good cross selection of books, including bedtime stories for young ones! Monopoly, Scrabble, Jengha, Twister, card games all provided. Small lawned area. Surrounding area all very safe for children to play & explore including our large field. Totally private, sits on a porch & is under cover, great for inclement weather, accessed via the master bedroom so no need to venture right outside! Bliss!! There is a fully equipped utility & boot room on entering the holiday barn, with a large heated rail to dry wet clothes. There is a washer/dryer, freezer & additional sink in the utility room. The property is 'upside down' living with an open plan lounge/kitchen/diner making for the most sociable environment, not leaving someone stuck in the kitchen whilst everyone else is relaxing. There is a wood burning stove with the initial supply of logs provided, more can be ordered. There is the option of a mid week housekeeping service including a change of towels. Whatever time of day you return to the barn, the temperature will be right for whatever time of year, delivered by underfloor heating supplied through the ground source heat pump. A constant temperature is maintained & it is lovely & cosy in the colder months, heating & hot water is 24 hrs a day, all included. 3 supermarkets deliver so why not order your groceries for your arrival, we will receive them & put them away for you too. We are always delighted when our guests have a great experience at Ford Old Hall Barn & particularly so when they recognise the high standards we deliver. It is our priority to ensure guests feel very welcome here, have an enjoyable stay in great surroundings & are able to relax as soon as they walk through the door. Nothing is too much trouble for us, we pride ourselves on the level of hospitality we offer, over & above our guest' expectations. We couldn't have asked for better accommodation, Ford Old Hall Barn is finished to a very high standard and the kitchen in particular is superb - everything is provided and well thought out. Lynn and Nigel are wonderful hosts who provided a very warm welcome with a tasty evening meal and wine (which was perfect after a long journey) and milk in the fridge for a much needed cup of tea, home baked bread and preserves and a home made cake which had been especially iced with my son's initial - these extra touches made this holiday stand out above all others, we would definitely recommend it and would absolutely stay there again. Thank you Lynn and Nigel. Thank you for your fabulous feedback, we really appreciate you taking the time to post a review for us, hope to see you all again in the near future....Lynn & Nigel. We took a short stay at the end March/early April. We have stayed at the Barn before. It really as is described in the promotional material. Lynn & Nigel have made every attention to detail and offer a luxurious facility that is extremely comfortable. The welcoming meal was a very nice touch after the long drive north. The hot tub - spotlessly clean - was fantastic to ease away the aches from the day's walking in the Peaks. Well done Lynn & Nigel - lovely people with a lovely Barn and great service - we'll return again! "Outstanding accommodation in a perfect location"
Stayed for 3 nights with my partner & young son - wonderful welcome with home cooked food and a bottle of wine. The barn conversion is outstanding with exceptional attention to detail & to the very highest standard. The hot tub is really clean & well maintained & it is clear that Nigel & Lynn (the owners) take great pride in the standard of their accommodation. 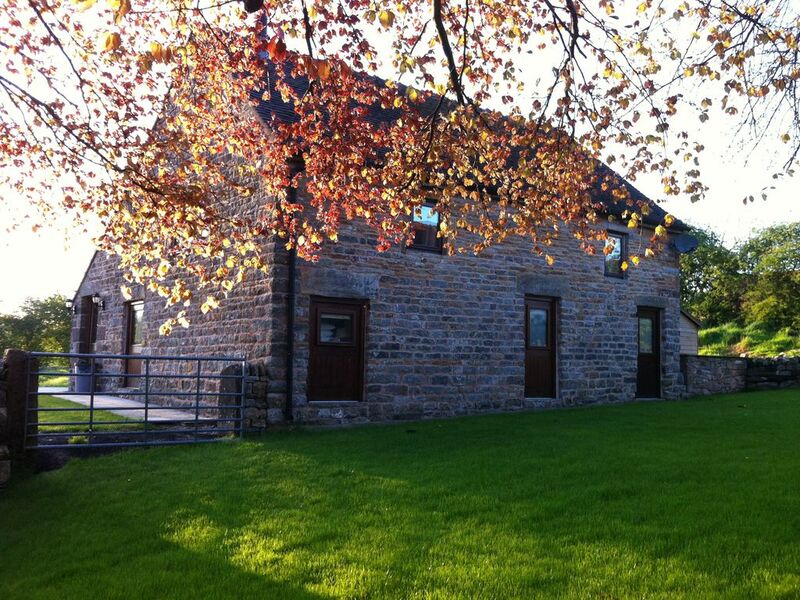 The barn is perfectly placed to explore the Peak District. We did Alton Towers & Chatsworth House which we thought were great. If you are looking for high end accommodation with a personal touch this is the place to be. We will definitely be going back. Thank you for taking the time & trouble to write a review for us, we strive to deliver excellence & pay particular attention to the details as it is very important to us that all our guests receive the highest standards throughout. We are delighted with your feedback & look forward to welcoming you all back to Ford Old Hall Barn in the future. "This place is wonderful! Exceptional hospitality"
Gorgeous barn, cosy, warm & comfortable, 5 star all the way! It's so nice to find somewhere so clean & a finish to such a high standard. The little personal touches (robes, cake, bubbly, cards, welcome etc) made us enjoy our stay even more. The hot tub is amazing! You can really see how much time & love (& money!) has been put into this place & it made our stay worth every penny! We strive to exceed our guests' expectations by providing hospitality above & beyond that which you would normally receive at a holiday cottage, it is what we are all about. We are delighted you enjoyed your your stay, thank you for taking the time & trouble to post a review, we do appreciate it. We will definitely keep doing what we are doing! Ford Old Hall holiday cottage sits in the secluded picturesque farming hamlet of Ford, in the Peak District National Park. A LUXURY barn conversion with HOT TUB & LOG BURNER, no 'hidden extra' costs, HOT MEAL with wine on arrival. Nestled off the beaten track, only 10 mins to ALTON TOWERS. 15mins to market towns of Ashbourne & Leek & all amenities. A real home from home to sleep 4 with walking straight from the door to explore the beautiful Peak District. The cottage enjoys a wrap around patio with a private HOT TUB area which is under cover & accessible from the ground floor without going outside, usable in all weathers. Garden furniture, bar-b-q, a shed to secure your bikes & a hot tub provides lovely relaxation at the end of the day. Parking for up to 4 cars. Dovedale, Staffordshire Moorlands & the spectacular scenery of the Manifold valley surround this farming hamlet which is nestled away from busy roads. Golf: Ashbourne, Derbyshire's oldest & friendliest golf club, 18 hole, awarded GolfMark & ClubMark by the EGU & EWGA with holiday guest membership available £70 for 2 weeks. Leek is one of North Staffordshire's premier golf courses, situated one mile south of the Queen of Moorlands town of Leek on the A520. A warm welcome is given to visitors where the course offers a fair challenge to all standards of golfers, visitors will require a valid handicap certificate & observe the clubs bye laws & dress code as displayed. Bakewell golf club is located only half a mile from the town centre, visitors are very welcome & will be able to play at most times. Green fees £15 per round weekdays & £20 week ends, 2 for 1 (£20) accepted by prior arrangement. Full weeks are Friday to Friday. Minimum booking is 3 nights. Week end is Friday to Monday, mid week breaks are 3 or 4 nights. A deposit of 50% of the total booking price will confirm & secure your booking, the balance becomes payable 8 weeks before the holiday start date. If your booking is made at 8 weeks or less to the holiday start date, then the full amount is payable upon booking. Once a deposit and/or full payment is made we do not operate refunds so please ensure you have the adequate level of insurance to cover any requirements you may have.